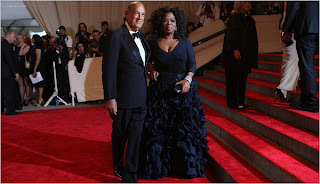 Last evening, the Metropolitan Museum of Art in New York City hosted the Costume Institute Gala; attracting a galaxy of stars for the event including one of the hosts, Oprah Winfrey, shown below with Oscar de la Renta. The photo shows the entrance to the museum which was completely enclosed and sheltered from the elements, courtesy of Stamford Tent & Event Services. The elegant entrance served as a runway of sorts; an opportunity for some of the most beautiful people in the world to ‘strut their stuff’ in front of photographers. This year’s theme celebrated American women,“American Woman: Fashioning a National Identity”. Where the top table price was $250,000, some other notable guests were Diane Lane, Naomi Campbell, Kate Hudson, Jessica Biehl, Jennifer Lopez, Taylor Swift, Janet Jackson, Gwen Stefani, Sara Jessica Parker, Ivanka Trump, Jessica Alba, Vera Wang, Anne Hathaway and Brooke Shields, to only name a few. Stamford Tent also provided the stage where Lady GaGa performed. Raul Avila’s amazing décor and the dramatic lighting from Frost Lighting helped create an awe inspiring event that won’t soon be forgotten by the attendees.